My aim with this article is to bring some attention to the size of the opportunity blockchain presents for software developers. Blockchain technology has become the phenomenon of 2017. According to Google, Blockchain and Bitcoin were two of the most-searched keywords last year. Blockchain is also one of the Top 5 Developer Trends Of 2018. Cryptocurrency, bitcoin, and ICOs (Initial Coin Offering) are fueling the blockchain discussion and increasing awareness of the technology. Today, more and more organizations are looking to take advantage of blockchain mania. As a matter of fact, 58% of the large corporations are interested in building some kind of blockchain application. So, here is the good news for software developers. Blockchain is all about software. Blockchain is all about how to store, share, and maintain data (transactions) securely. The blockchain concept was first introduced by Stuart Haber and W. Scott Stornetta in 1991 as “a cryptographically secured chain of blocks,” which means a chain or blocks that are linked and cryptographically secured. Each block is a combination of three items, a hash pointer to the previous block, a timestamp, and transaction data. By design, blockchains are secure and difficult to modify. Blockchain is a technology to create and maintain cryptographically secure, shared, and distributed ledger (a database) for transactions. Blockchain brings trust, accountability, and transparency to digital transactions. All transactions that exist on a blockchain are shared and distributed among a network of peer-to-peer computers. Transactions are encrypted and decrypted using private and public keys. Let’s remove the security part from the list, I bet, most enterprise systems do not want to be public, transparent, or distributed. Also, a system built on blockchain does not only take a longer time to process transactions but also requires many more times the resources such as processing, electricity, and data transfer. If that is the case, you don’t really need blockchain. Obviously, blockchain is not for everyone. Building blockchain applications are complicated, time consuming, transparent, and costly. Here is my article, Do You Need A Blockchain that will ask you the right questions and give you the answer to whether or not you really need a blockchain. Blockchain isn’t industry specific. Blockchain is useful where you need to bring transparency and accountability to a system. If you look at some of the obvious industries that lack trust, include banking, financial institutions, insurance, healthcare, pharma, investment firms, and money transfer, obviously, these industries could use blockchain to bring trust to the system. Blockchain brings trust to a system. Banking, payments, supply chain, insurance, security, and healthcare are a few industries that have already stated building blockchain-based applications. As mentioned earlier, 58% of large corporations are considering some kind of blockchain adoption. Obviously, this will lead to more jobs. One of the key reasons blockchain had a remarkable 2017 is bitcoin, cryptocurrencies, and Initial Coin Offering (ICO). Bitcoin worth has grown to $247 billion from $11 billion in less than 12 months. Over $3.25 billion have been raised in ICOs in 2017 alone, surpassing traditional VC funding. Filecoin and Tezos, the two largest ICOs, raised $357 million and $232 million respectively in a matter of days. If you’re new to bitcoin, check out What and Why Bitcoin to learn everything about bitcoin. Some of the bitcoin and similar projects include Bitcoin Cash, Litecoin, and Bitcoin Gold. The following chart shows Google Trends for blockchain (blue), cryptocurrency (yellow) and bitcoin (red). Banking is one of the industries that is leading the blockchain innovation. The following image from BI shows major banks and financial institutions involved in blockchain.Supply chain management, global logistics and shipping, healthcare and pharma, and even governments are now exploring blockchain implementations. For software developers, the blockchain opportunity is huge and it is just getting started. 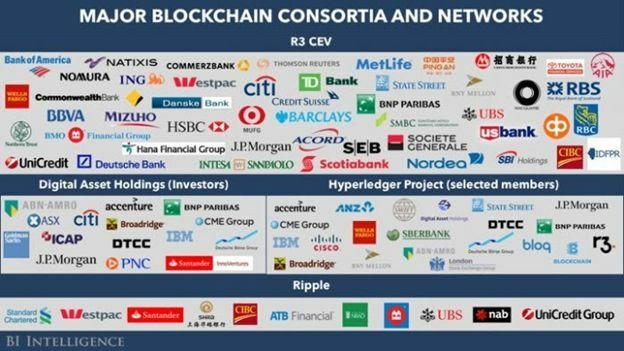 Some of the companies leading the charge in blockchain technology include IBM, Microsoft, Deloitte, Ripple, Chain, Circle Internet, BitFury Holding, Yuan Technology, Coinbase, and AlphaPoint. Since six out of 10 corporations are interested in blockchain, it simply means more jobs will be created in this space. The blockchain technology market size was $340 million in 2017 and is expected to grow to $2.3 billion by 2021. According to a report, 10% of GDP will be regulated by a blockchain by 2027. Today, there are thousands of blockchain projects available in Github and each of the projects has a specific purpose. Here are some of the top blockchain projects and their purpose. Cardano is a decentralized public blockchain and cryptocurrency project and is fully open source. Cardano is developing a smart contract platform which seeks to deliver more advanced features than any protocol previously developed. It is the first blockchain platform to evolve out of a scientific philosophy and a research-first driven approach. The development team consists of a large global collective of expert engineers and researchers. NEM is the world's first Smart Asset blockchain. Built from the ground up for enterprise-grade performance, NEM's blockchain technology delivers a world class platform for management of almost any kind of asset: currencies, supply chains, notarizations, ownership records and more. NEM’S power is exposed through a straightforward and secure developer interface so that you can deploy your blockchain solution in record time. Whether you are building the next best mobile app or bringing blockchain into your existing business infrastructure, NEM makes blockchain work for you. Stellar is a distributed, hybrid blockchain that is fully open-source. It is infrastructure that exists to facilitate cross-asset transfers of value, including payments. With just one integration into the Stellar Network, you will join an open, global financial network where all actors – be they people, payment networks, or banks – have equal access & economic participation. IOTA: As the Internet-of-Things keeps expanding, the need for interoperability and sharing of resources has become a necessity. IOTA enables companies to explore new business-to-business models by making every technological resource a potential service to be traded on an open market in real time, with no fees. Dash is Digital Cash You Can Spend Anywhere. Use Dash to make instant, private payments online or in-store using a secure open-source platform hosted by thousands of users around the world. NEO is a non-profit community-based blockchain project that utilizes blockchain technology and digital identity to digitize assets, to automate the management of digital assets using smart contracts, and to realize a "smart economy" with a distributed network. NEO was founded in 2014 and was real-time open source on GitHub in June 2015. Since its inception, the NEO team has experienced the upsurge and boom of the blockchain industry and the frenzy and cooling of the digital money market. They believe technology drives progress and together we can create the future. Motivated by this, NEO has been created to shift our traditional economy into the new era of the "Smart Economy". For C# developers, Stratis Platform offers simple and affordable end-to-end solutions for development, testing and deployment of native C# blockchain applications on the .Net framework. The stratis Development Platform allows businesses and organizations to develop blockchain applications in C# utilizing the Microsoft .NET Framework. They can assist you in defining your blockchain strategy and in integrating solutions and capabilities according to your business requirements.